This question I read a lot and it is not easy to answer in my opinion. The best adjustable wrenches can be different for each of us. For example if you only work on small engines you could get away with a smaller size and less durable then when you work on a large vehicle like a tractor trailer with much large bolts. 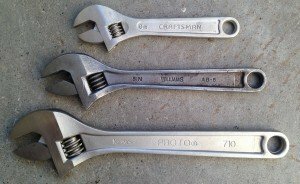 No tool box should be without an adjustable wrench although my old teacher hated them. His opinion was that you should always use a fitting wrench and an adjustable was in his opinion no good because it never fitted precise enough. I think that the quality since he told me that about 45 years ago has improved very much and the fit and grip are extremely well. Bahco is made in Sweden as far as I know but is a brand I have in my own toolbox. Irwin used to be made in America but moved their production to China in 2008. Closing their Nebraska plant after 80 years. According to them to keep the prices compatible. Craftsman is also mainly made in China. Finding tools that are 100% made in the USA is hard nowadays. have a look at our reviews of the adjustable wrenches and pick the right size for your job.